Looking for smart ways to save some money in the new year? Here’s a thought: instead of buying overpriced juice at whole foods, squeeze your own! It’s far fresher than any juice you’ll buy in a bottle, and it usually tastes better too since you can fine tune your recipe using the exact combination of fruits that you want. If you don’t already have a juicer, don’t worry because you’re in luck. 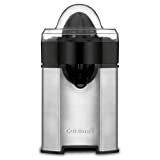 The Cuisinart CCJ-500 Pulp Control Citrus Juicer happens to be the best-selling citrus juicer on Amazon, and it’s on sale right now for less than $22.